What Happened To The Shanghai International Gold Exchange? Withdrawals from the vaults of the largest physical gold bourse globally, the Shanghai Gold Exchange (SGE), accounted for 54 tonnes (in week 45 / 16 until 20 November), up 10 % from last week. 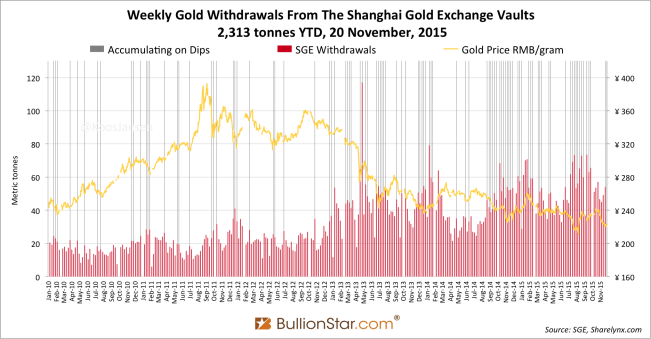 Year to date SGE withdrawals have reached 2,313 tonnes, which is an all time record. Given elevated SGE withdrawals and continued weakness in the gold price it looks like the Chinese population is buying the dips. 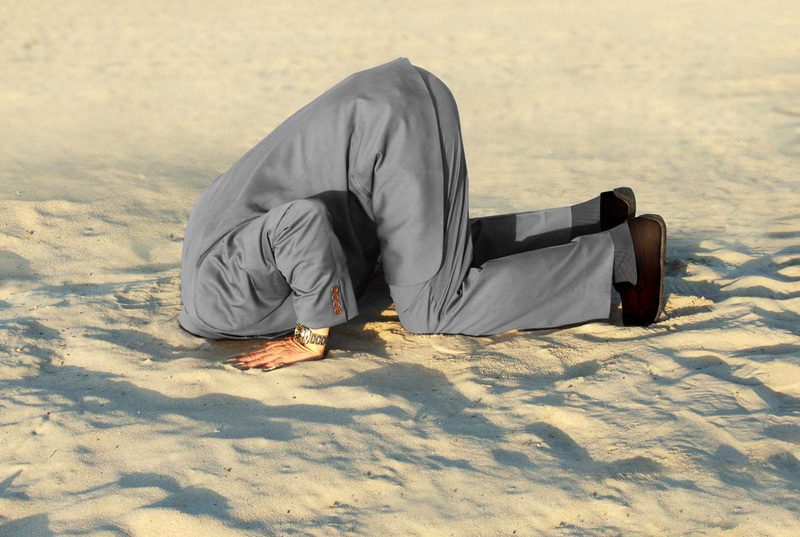 The Chinese central bank (PBOC) is likely doing the same, but not through the SGE. 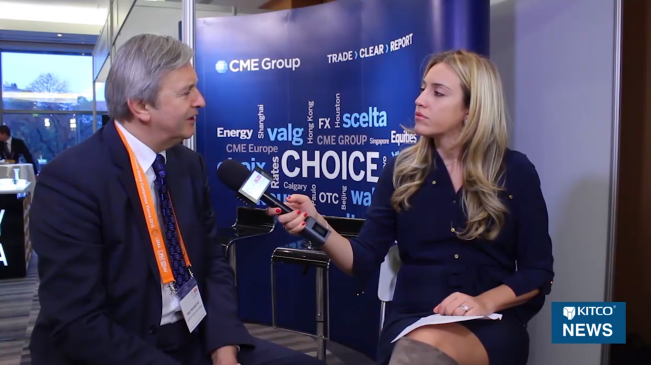 The PBOC does its monetary gold purchases in the international OTC gold market – for example, in London or Hong Kong. According to Reuters China has imported 72 tonnes of (non-monetary) gold from Hong Kong in October – this gold is required to be sold first through the SGE, it’s not directed to the PBOC. Data from the Hong Kong Census & Statistics Department has not been released, but Reuters has a contract with the Department in order to obtain data a few days before the public release. Known gold exports to China year to date: From January until October Hong Kong has exported 653 tonnes to China mainland, which is 784 tonnes annualized. 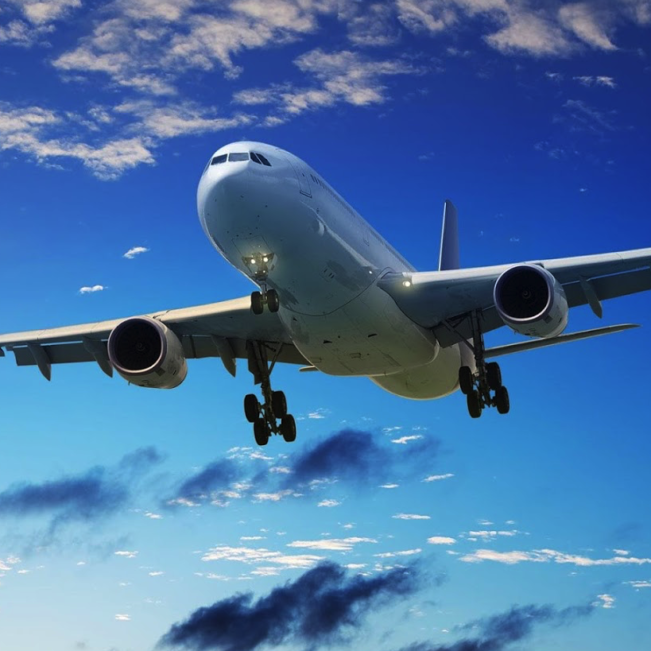 Switzerland has exported 217 tonnes to China from January until October, annualized 260 tonnes. The UK shipped 210 tonnes to China in the first nine months of this year, annualized 280 tonnes. Australia net exported 49 tonnes in seven months, which is 84 tonnes annualized. So, without counting shipments from exporters such as South Africa and Singapore, China has imported 1,129 tonnes of gold year to date and is on track to import 1,408 tonnes of (non-monetary) gold in total this year. In addition, Chinese domestic mining output is set to reach 476 tonnes. Chinese apparent gold supply – without counting scrap – in 2015 will be 1,884 tonnes. 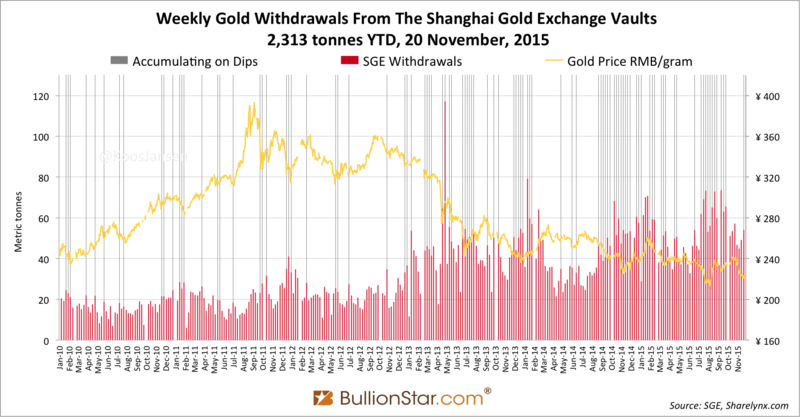 Using SGE withdrawals as a measure for Chinese gold demand can be slightly deceiving for a number of reasons. For example, Chinese citizens can buy gold on the SGE but prefer not to withdraw this metal from the vault, or chose to withdraw next month/year. This way, wholesale demand would actually be higher than the amount of gold being withdrawn. On the other hand, since the inception of the Shanghai International Gold Exchange (SGEI) gold can be withdrawn from SGEI (IB) Certified Vaults in the Shanghai Free Trade Zone (SFTZ) and exported abroad. According to the accounting rules from the SGE, any SGEI withdrawal is included in SGE withdrawals. An export from the SFTZ would be included in SGE withdrawals. I’m always occupied with the details regarding SGE withdrawals, why we can use it as a measure for Chinese wholesale gold demand and why not. I think SGEI withdrawals can have been a cause for inflated SGE withdrawals this year. Late 2014 and early 2015 I’ve written SGE withdrawals could have been distorted by withdrawals from the SGEI. For a while I corrected SGE withdrawals by SGEI trading volume to be conservative about Chinese wholesale gold demand. We simply didn’t know what happened to the SGEI gold that was traded – was it withdrawn from the vaults or not withdrawn. Then, in February 2015 SGE chairman Xu Luode published some figures in an article for Bullion Bulletin that pointed out most of the SGEI trades that were withdrawn from the vault was imported into the Chinese domestic mainland. 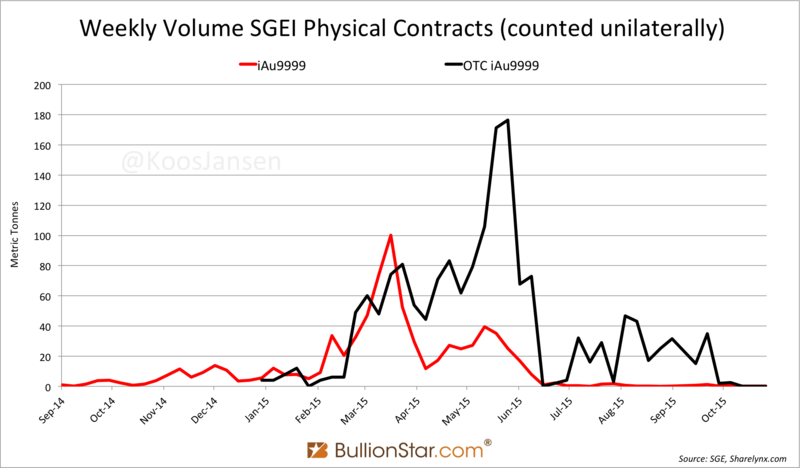 Meaning, SGEI trading volume could only have slightly distorted our measure of Chinese wholesale gold demand (SGE withdrawals). 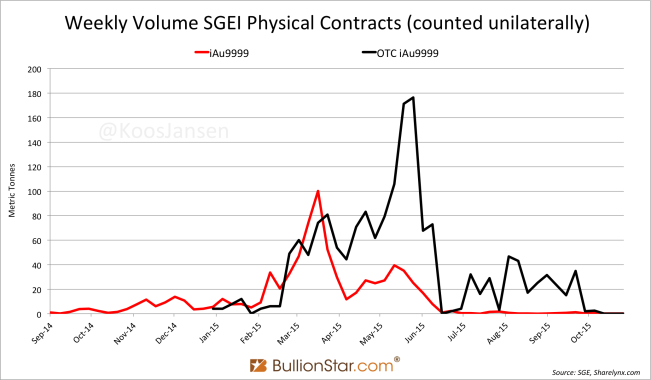 After a run up in SGEI trading volume this year, from January until March, it appeared trading of iAu9999 (the most commonly traded SGEI contract – 1 Kg 9999) severely declined in recent months and I stopped subtracting SGEI trading volume from SGE withdrawals to measure Chinese wholesale gold demand. 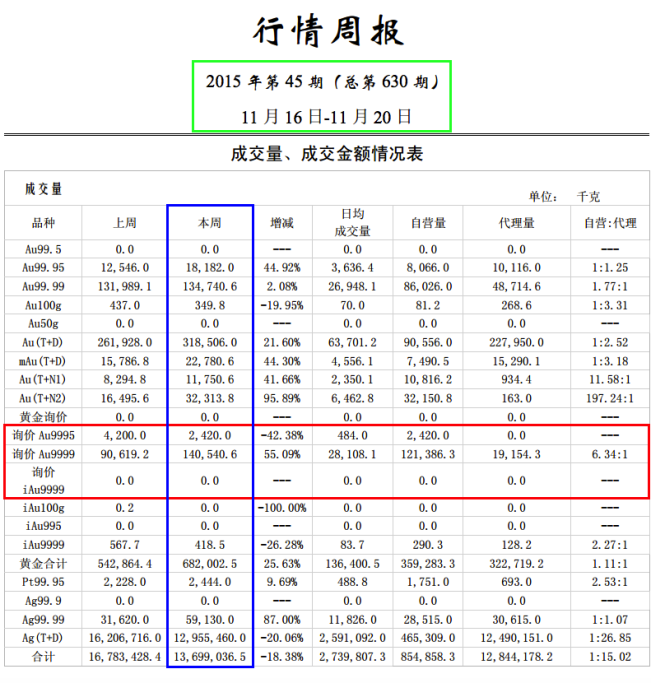 But, the other day I studied the Chinese SGE weekly reports. What I failed to see in recent months was that iAu9999 has been trading in the Chinese OTC market. Mea culpa. In the Chinese OTC market SGE contracts can be negotiated off-SGE, while settlement is done on-SGE. In the Chinese weekly SGE reports we can see OTC trades on the first page. Below is a screen shot of the report, the OTC settlements are framed in red. Framed in blue is ‘this weeks’ trading, which was in week 45 (framed in green). Some analysts, including myself, thought the SGEI was dead. But it isn’t. 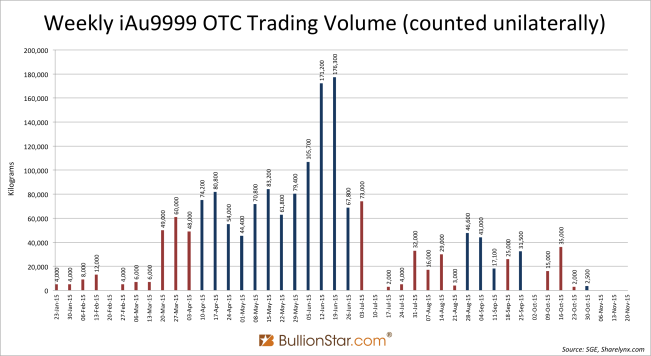 In June OTC iAu9999 volume transcended a whopping 170 tonnes a week. 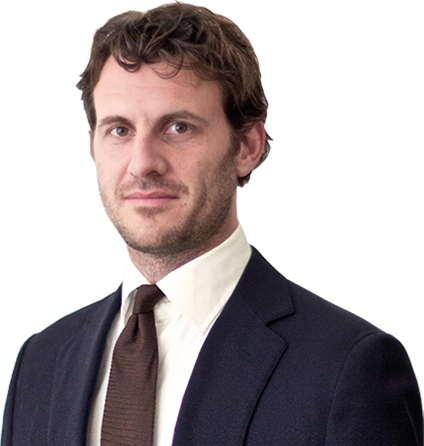 First of all, the iAu9999 contract is traded increasingly in the OTC market. In the chart above the black line resembles OTC iAu9999 trading volume. 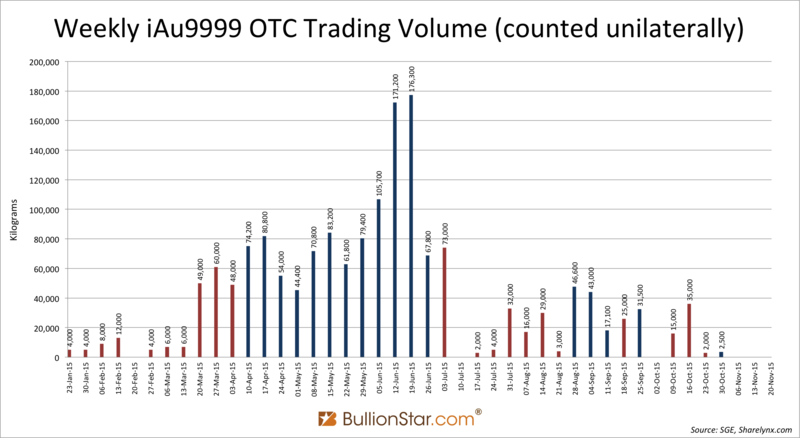 In the OTC market volume has declined from a peak in May, but I wouldn’t say trading has ceased. The gold stays in the vault. The gold is withdrawn and stored elsewhere in the SFTZ. The gold is withdrawn and imported into the Chinese domestic gold market. 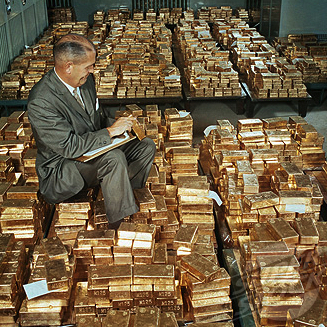 The gold is withdrawn and exported to, for example, India. 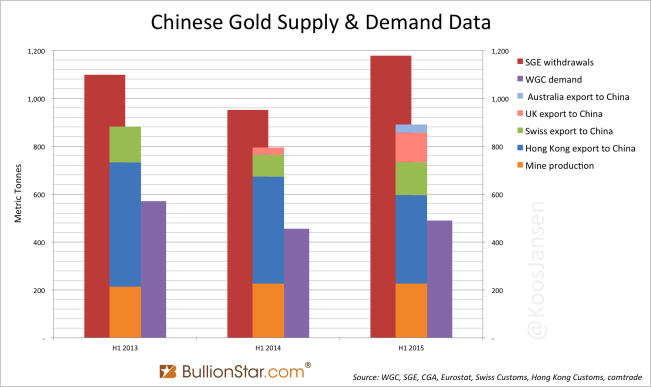 Option 2 and 4 would increase SGE withdrawals without increasing Chinese wholesale gold demand. When looking at the numbers from the OTC iAu9999 trading we can see an interesting pattern. Have a look at the data labels in the chart above. We can see that all weekly OTC iAu9999 volumes end on two zeros (blue bars) or three zeros (red bars). 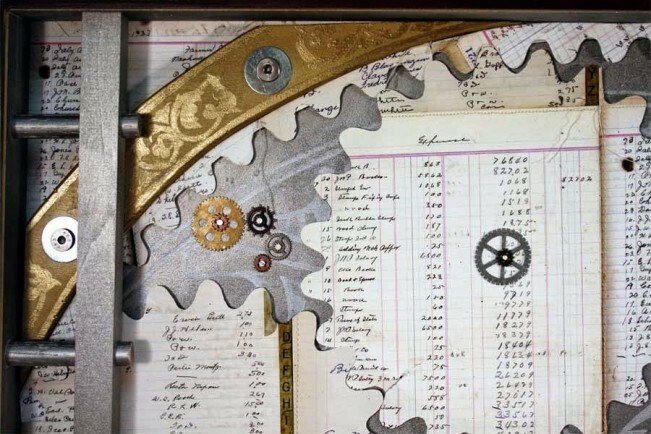 These volumes are the sum of all trades executed during the week. It’s safe to conclude these volumes are exchanged by large traders, as iAu9999 is changing hands in batches of one hundred (blue bars) or in some weeks one thousand (red bars) 1 Kg 9999 bars. For example, in the week that ended 3 July 2015 exactly 73,000 Kg’s were traded. In theory, 20,855 Kg’s were traded on Monday and 52,145 Kg’s on Thursday, aggregating at 73,000 Kg’s in total for the week. Though, this coincidence cannot have occurred each and every week. More likely the OTC iAu9999 traders buy and sell per 100 or 1000 Kg’s. No other SGE or SGEI contracts show this bulky trading pattern. … Using the International Board [SGEI] as a launch pad, China’s gold market will embrace greater openness and foster stronger ties with its neighbours and, together, elevate the trading and pricing influence of Asia in the world’s gold market. As a perennial major consumer of gold and a close neighbor of China, India will undoubtedly become one of SGE’s most important partners in the coming years. SGE looks forward to forming close partnerships with the Indian market. Imaginably, the iAu9999 purchases were withdrawn from the SGEI vaults in the SFTZ and exported to India. Though, India’s trade statistics can be tracked very precisely and only a small amount of gold has been exported from China to India since the SGEI was erected in September 2014. In the table above we can see India imported 1.205 tonnes from China Since September last year. These imports into India can be processing trade from any Free Trade Zone in China (no SGEI involvement required), but can also be from purchases at the SGEI in the Shanghai Free Trade Zone. 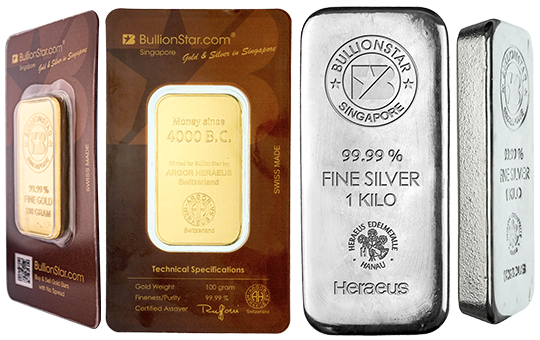 In the latter scenario these exports would have been captured in SGE withdrawals (the metal is bought at the SGEI, withdrawn from the IB Certified Vault and exported). In any case India imported very little gold from China in the past year. The only other gold importer from China I could find was Thailand at 1.488 tonnes, which makes me think foreigners have not yet been very active on the SGEI. More likely, at this stage, is that SGEI withdrawals are imported into the Chinese domestic gold market. Another option, given the large round number volumes, is that OTC iAu9999 is trading in China’s foreign exchange market. 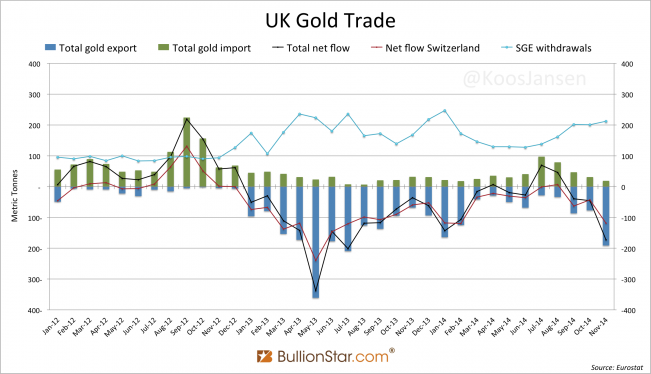 I should add, the customs departments from Switzerland and Hong Kong confirmed that when gold is exported from local soil to the Shanghai Free Trade Zone it’s disclosed in their data as an ‘export to China’. It is irrelevant if that gold is ever imported into the Chinese domestic gold market. No matter what happens to the gold in the SFTZ it is initially disclosed as an export to China. 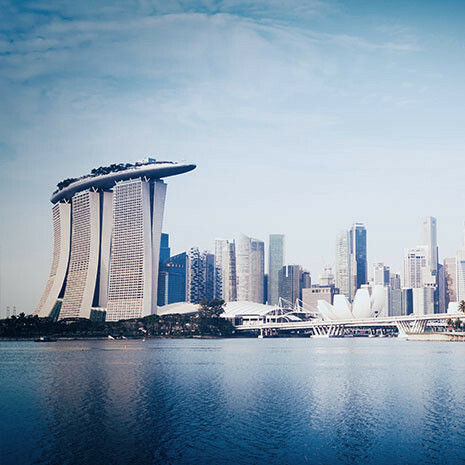 In short, trading at the SGEI can have blurred SGE withdrawals this year. More research should point to what extent.